There's a portugese church near my house. It's basically across the street from my balcony, so you can hear them outside whenever they're throwing a party. And do they ever throw parties. During the summer, there's almost always something going on every weekend. It's a very lively place. Some weekends, which ones I have yet to determine, they throw an especially loud party. We have coined it the "meat-on-a-stick" festival, because of how they celebrate. I met Avery, cpirate and gorbash_dragon in the parking lot in front of the church, and we took in the view. The building is covered in outdoor lights. You know, the ones that people string up on their houses near Christmas. But these were thoughtfully arranged around decorations and things, so that they lit up in cheerful, tacky designs. There was a band at one end, with drums and trumpets and guitars. They were singing some tune that was completely unrecognizable to me. At the other end were white outdoor tents, set up to sell various foods. From those tents sprung a variety of queues. One queue was for some sandwiches, which seemed to be quite popular. Another popular tent was the one selling beer on tap. And the most popular one seemed to be the temporary bakery that was churning out loaves of fresh corn bread. Snuggled in the middle of these was the meat tent. If you paid $8, they would give you a skewer loaded with hunks of beef. They covered it with a mixture of garlic, parsley, and a healthy shower of kosher salt. You'd then take this over to a series of barbeque pits that were busily turning logs into charcoal. There, you endured smoke and flame while rotating your meat until it was done. We had five skewers among us and I made sure we were all very well fed. The burns were worth it. With plates of meat in hand, we retired to my apartment for beverages and fresh peach ice cream. It was the best supper I've had in ages. I haven't a clue. I shall keep my eye out for more, though. Yeah that meat was goood! Did you go as well? I went Saturday afternoon for a lunchtime meat coma, and then popped by briefly that evening too. If you go to Romados there are usually pamphlets on the walls with upcoming events. which are events in the basement of the church. You can always ask the staff at Romados they will be glad to tell you. Those tips are most helpful! I didn't notice, but the next time I'll take photographs of the band and you can see if that's true. I had always planned to get azrhey to show me around one of these BBQ events, but somehow I ran out of time. Oh fun! I totally know that church. It is on/near St. Urbain and it is always so festive. One of my best friends lived a few houses south. 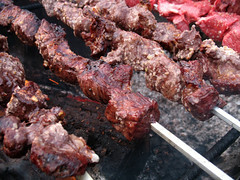 I also had many meat on a stick experiences on the weekend. I, however, was alone for the most part and didn't get to cook on my own food. Just ate and muttered to myself. Much more fun with company. And also fresh homemade peach ice cream. Those sound tasty as well! I'm not sure I could make it to four festivals in a row, though. I have a tendencies to collapse after two. I am planning on attending one of the festivals that church holds in August. Can you recommend some hotels I could stay at? I have a dog. Small jack russell. I'm sorry, I have no idea about hotels in this city, as I live here. That's weird, but kinda makes sense, doesn't it? Please enjoy your stay in town. And have a lot of fun!